The first rule of any wedding is to always listen to the bride! And what does the bride want for her hen do? A great night out surrounded by her friends, dancing with a cocktail in the hand and a delicious bite to eat in the other! Every Saturday there is amazing food from all over the world and every week we have a brand new selection of street food trucks and stalls. We have plenty of free of charge tables and seating areas. Our premium bar and a flowery cocktail serve many delicious drinks, from craft beers to exclusive Urban cocktails and prosecco. For the brave we also have our famous foam shots that top off a shot of your choice with flavoured alcoholic foam (weird, I know, but so much fun!). You can expect to see live bands and singers-songwriters serenade the crowd and they are very open to taking requests, especially from a bride or groom-to-be! In between the live artists we have a soundtrack that has something for everyone and will definitely get you dancing after a few of our potent cocktails (Not on the tables please – we don’t want any injuries!). We have free of charge games on our tables including giant jenga, froggy darts, giant playing cards and giant connect 4 plus a free of charge ping-pong table to enjoy (that can easily be adapted for beer pong – I know you were wondering). We can also create a custom experience for you! 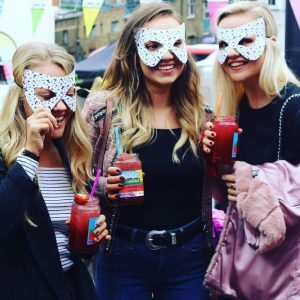 Our markets team can arrange party extras such as party hats, bottle table service, themed cakes, bar tokens, street food vouchers, goodie bags, balloons, party poppers and other special requests. For more information please email sophie@urbanfoodfest.com or contact the Urban Food Fest office on 020 7563 3021.